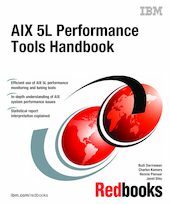 This IBM Redbooks publication takes an insightful look at the performance monitoring and tuning tools that are provided with AIX 5L. It discusses the use of the tools as well as the interpretation of the results in many examples. This book is meant as a reference for system administrators and AIX technical support professionals so they can use the performance tools efficiently and interpret the outputs when analyzing AIX system performance. A general concept and introduction to the tools is presented to introduce the reader to the process of AIX performance analysis. - Additional performance topics, including performance monitoring API, Workload Manager tools, and performance toolbox for AIX.